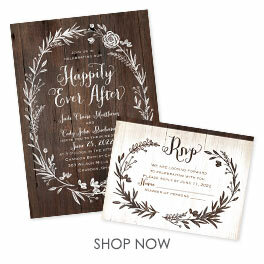 Some wedding invitations are simply beyond beautiful! These elegant invites feature an intricate flourish frame highlighting your wording. Your names and wedding date appear on the outside front of these folding invitations with a matching flourish design. Design and wording are printed in your choice of colors and fonts. This Invitation with Online Reply is cleverly designed to include everything you need in one self-mailing piece without the fuss of additional cards. Open it to reveal your invitation wording and room for other important details below, such as reception and/or accommodations information. The RSVP date appears with your wedding website (or email and phone number) at the bottom. Seals are included for securing these invitations closed when mailing. Your return address is printed on the outer flaps for no additional cost. Envelopes aren't needed. LOVE LOVE LOVE!!!!! I was in awe when I saw these invitations. These are beautiful and amazing quality for such an affordable price. I received the invites very quickly too. Thank you very much. 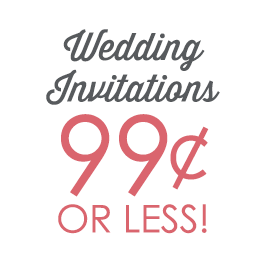 Beautiful, Amazing Invitations for a Great Price! The product was amazing, and looked very high quality. I was impressed! The only mistake that I made was not being careful about the color of paper when I ordered. I would've preferred the Ivory, but the White looks great too, which is what I accidentally got. Oh well! Still very pleased with this invitation and the cost that it saves us by having a place to put a link to RSVP and/or phone number. They sent the invitations in a very timely manner, and provided the perfect amount of email updates.